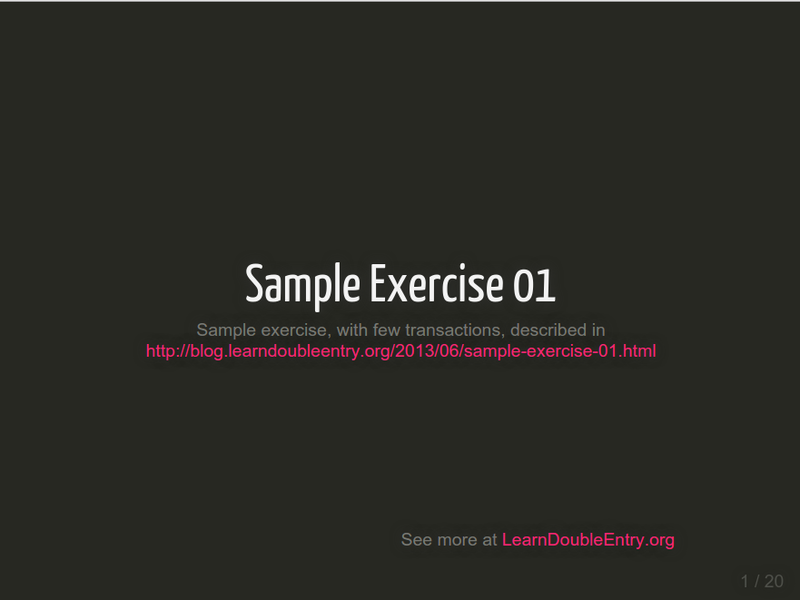 If you are a teacher or an instructor, and you want your students to practice accounting, LearnDoubleEntry.org might be the right tool to use. each student can see what other firms have done, so it is easy to simulate a world of firms interacting with each other (we'll soon provide an interface to make it even easier). [update, February 5th, 2017] it is possible to prepare exercises/challenges for students. If you or one of your students prepare a chart of accounts that you want other students to use, you can either pass them the slug of the firm or ask us to make it public, so that everybody will find it listed. If you need more information, we'll be glad to help. This is an open source and free resource, and lives thanks to the contributions of its users. Just email us to info@learndoubleentry.org or use the contact form. 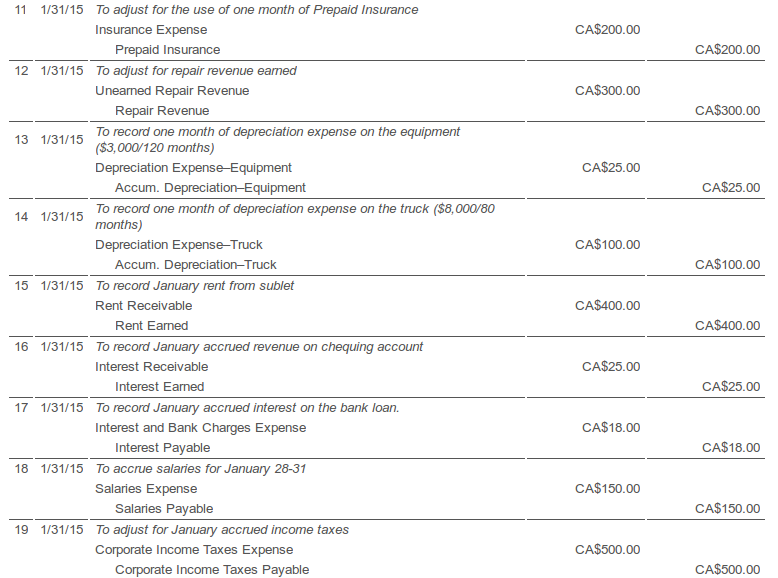 Existing accounts in the default chart of accounts can not be deleted. 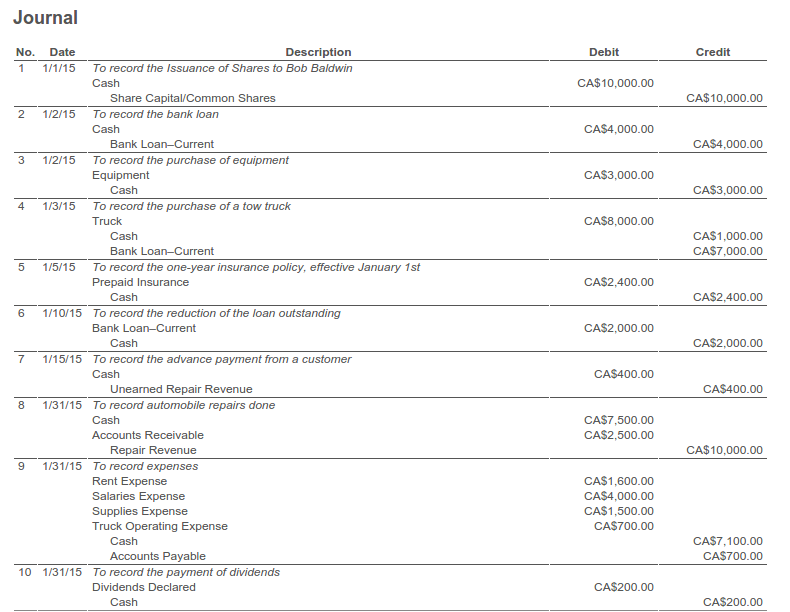 As a result instructors, particulary in the U.S. will need to create their own chart of accounts. 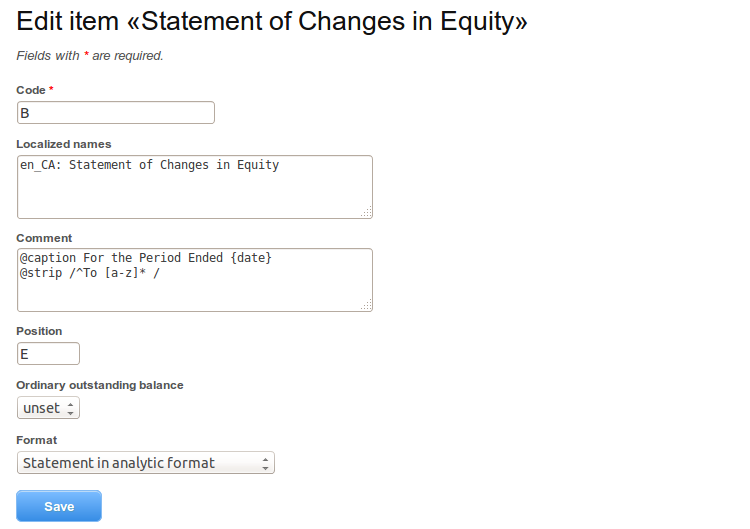 The account number, not the title must be entered when creating a journal entry, otherwise error messages occur. Existing accounts can of course be deleted. The only limit is that an account can not be deleted when either: a) it has some children or b) it is used in some journal entry. 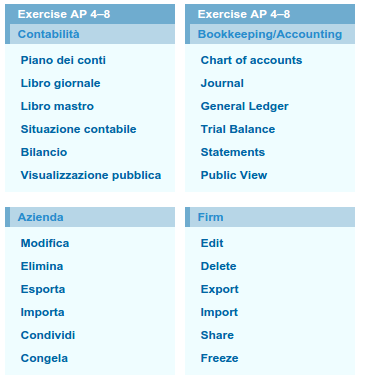 And there is a standard US-GAAP Chart of Accounts ready to be used. When you add a journal entry, you can choose an account by entering its code, or typing part of its name, or choosing it through a tree-view window. If this doesn't work, it might depend on browser-related issues. In case, please contact us. 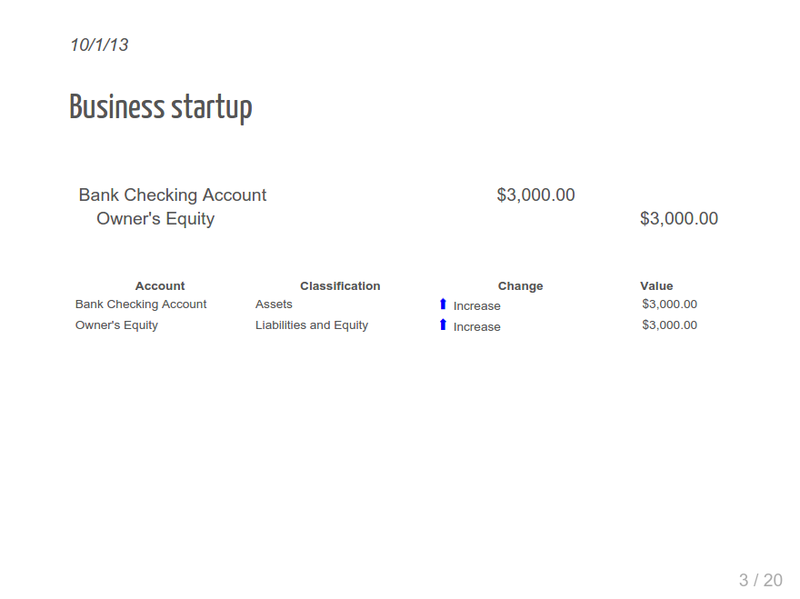 Anyway, we'll try and improve the interface to make this clearer and easier. As an experimental feature, we added the possibility of having different styles associated with accounts in the journal of the public page and in the slideshow of a firm, here at LearnDoubleEntry.org. Let's say you want to have all assets in blue, all liabilities in red, all revenues in green and all expenses in orange. Well, actually you don't need to do that for each account. 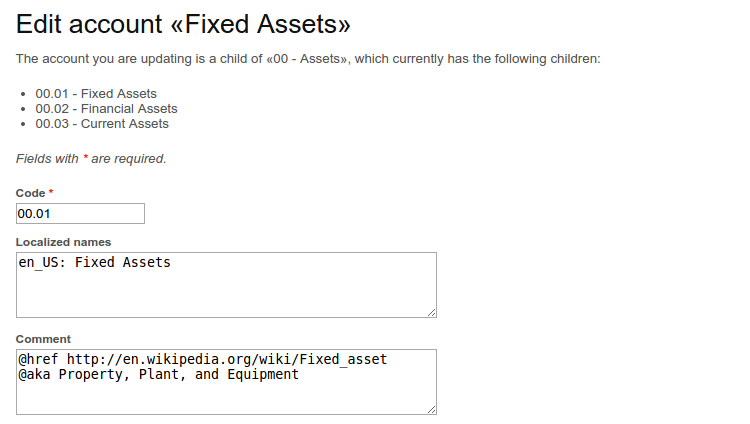 The classes you specify are automatically inherited by all the children accounts. 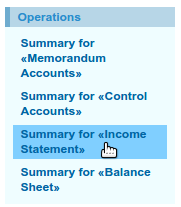 In the Chart of Accounts page, at the bottom, you'll find a link saying Toggle visibility of classes that helps you visualize how inheritance is applied. 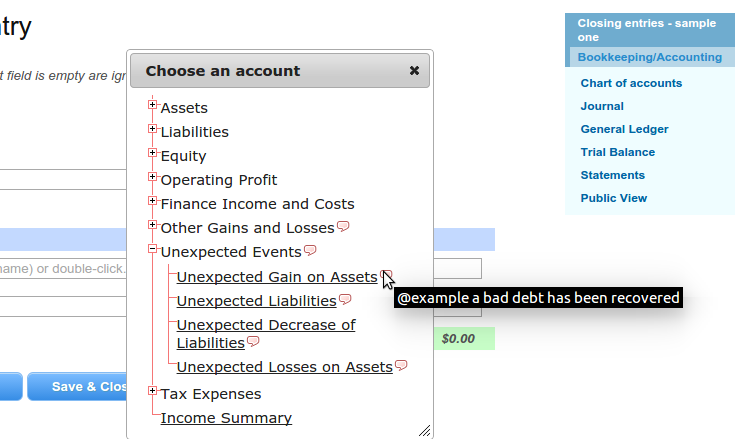 An account can have more than a class, and inheritance is not affected. 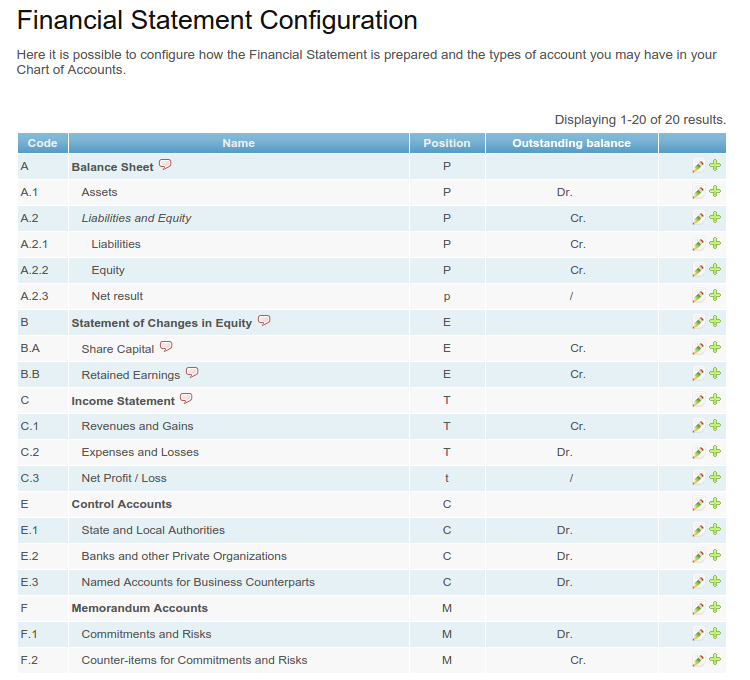 This might be useful because in a complex chart of accounts you could desire to have a distinction between fixed assets and current assets. Nothing prevents you to specify a class assets at the main level, and an additional class fixed at a lower level. 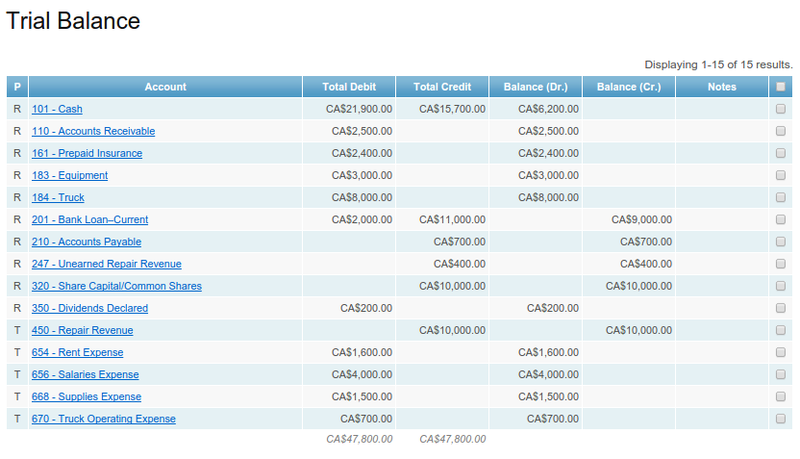 The result will be that you'll have two classes for the children accounts, like fixed assets. If you want to prevent inheritance, you can put an exclamation mark after the class name. Once you have defined your classes, how can you get colors? 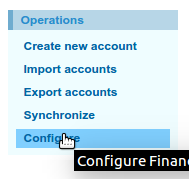 In the page of the configuration of the firm, click on Show advanced options: you will be presented a text area named CSS. If you want to know more about CSS, start with reading the pages at W3School, and if you have ideas for improvements, please share them with us. Some teachers like to show the journal entries of a firm and explain them to their students. Others may ask the students to show their work, entry for entry. What about letting the application generate a slideshow from the firm's data? As an added feature, you can press "p" to toggle the so-called presenter mode, and "c" to clone your view in a different browser's window. Let us know if you have ideas on how to improve this. 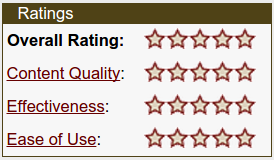 Our website got recently a five-star peer review on Merlot.org, a program of the California State University System aimed to provide a Multimedia Educational Resource for Learning and Online Teaching. The review led to five stars on Content Quality, Potential Effectiveness as a Teaching Tool and Ease of Use for Both Students and Faculty. There are some concerns, but they denote a lack of documentation on our side more than a deficiency in the application itself: in the next days we'll add some information in the handbook to fix this. Many thanks to the reviewer! Update: We wrote a new blog post, Instructions for Instructors, when we explain better what teachers can do and expect from the website. It is now possible to toggle the visibility of the different sections of the public page of a firm: the description of the firm, the journal, and the statements. It is also possible to toggle the visibility of the excluded journal entries in the journal. This is expecially useful if you want to print only some of the things shown in the public page. For each account, you can set some comments that could help to understand how to use it or to find some extra information. The format of the comment is free, so you can just type what you need. But, to stay organized, it is better to use some keywords to express special meanings (keywords are at the beginning of the line, prefixed with a '@' symbol). @check, when we are not sure of the name or of other information (help us to improve the chart of accounts if you can answer our doubts). Some kewyords, if used, are specially interpreted by the application. For instance, @href makes the text afterwards a link, as you might have noticed. 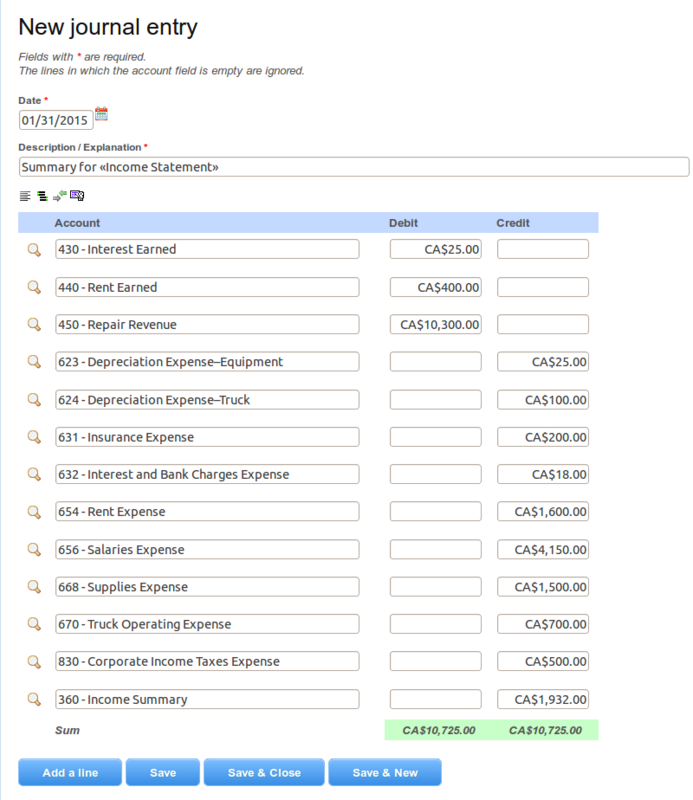 Keywords and comments play a special role in the Financial Statement Configuration, where instead of accounts we have items that keep accounts organized and let us fine-tune how the Financial Statement gets prepared. 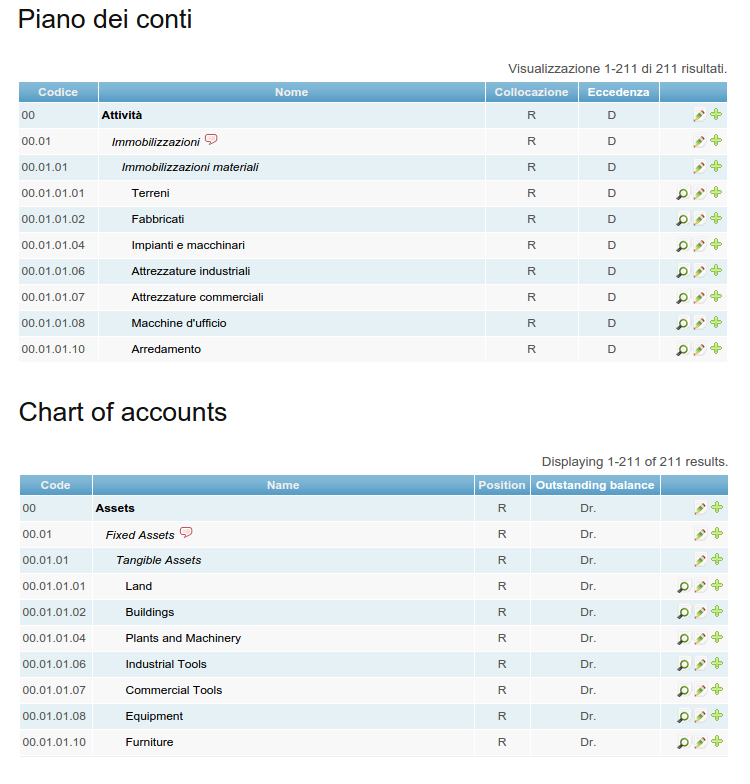 @analyze, to tell the application which accounts have to be analyzed. 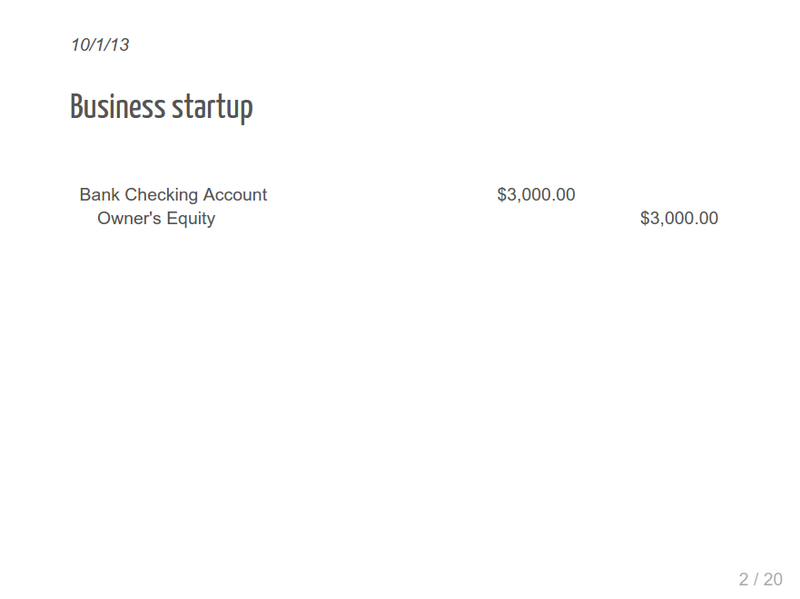 @closing, that you might want to set to "no" if you don't want for the related accounts to be proposed a closing entry. Other keywords for our smart comments could be introduced in the future. Meanwhile, you can safely play with the above ones. 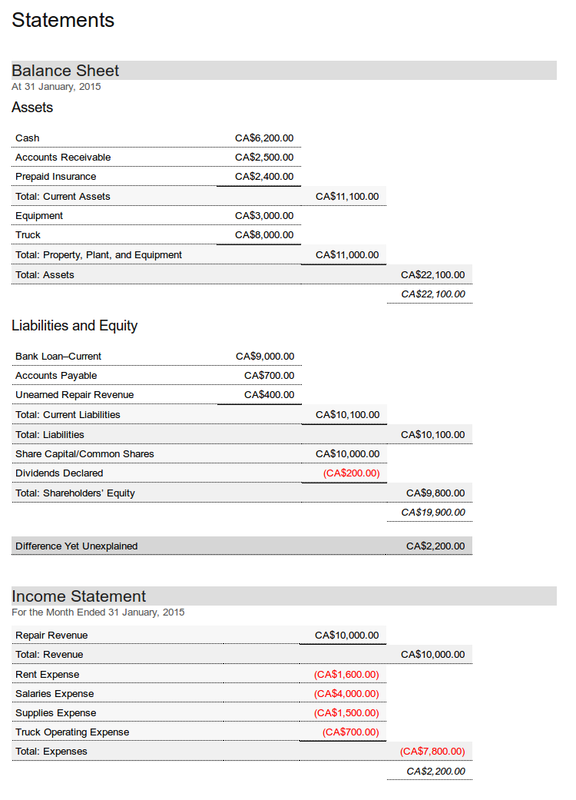 In our last post, we saw how the Balance Sheet, the Income Statement and the Statement of Changes in Equity are prepared and shown to us by the application. To complete the work, we have to cover another little but important detail: automation. 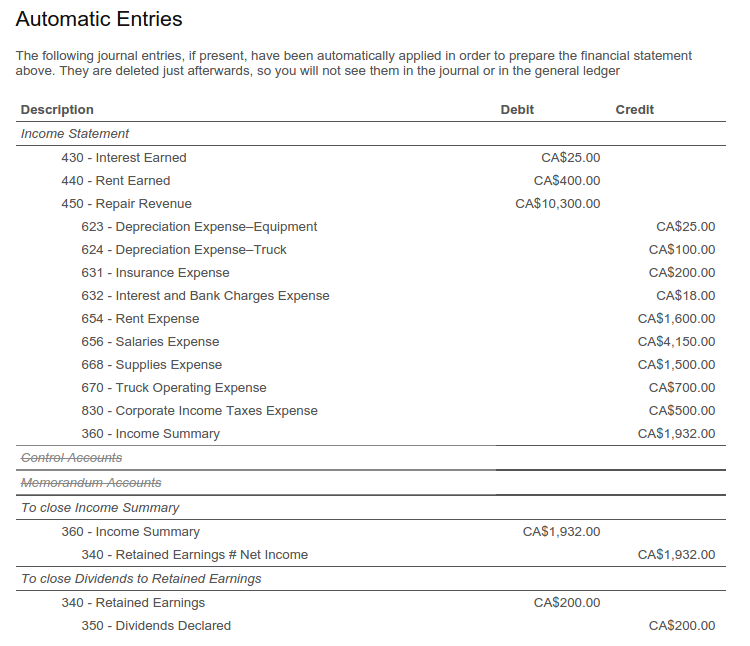 As you might have noticed, there is a problem when we want to prepare the Financial Statement at the end of a period (say, at the end of the month), because there is a "difference yet unexplained" showing up before we close Income Summary to Retained Earnings and Dividends to Retained Earnings. The application takes into account what has been recorded in the journal, so, before these entries, there is no way to have the correct data. But we don't want to actually write such journal entries at the end of each month, do we? The solution lies in preparing some templates for the journal entries, and mark them to be automatically executed each time the statements are prepared. A template is a place where we can define how a journal entry is made. If we frequently sell services of some kind, for instance, instead of choosing each time the accounts to use, we just prepare a template for the entry. 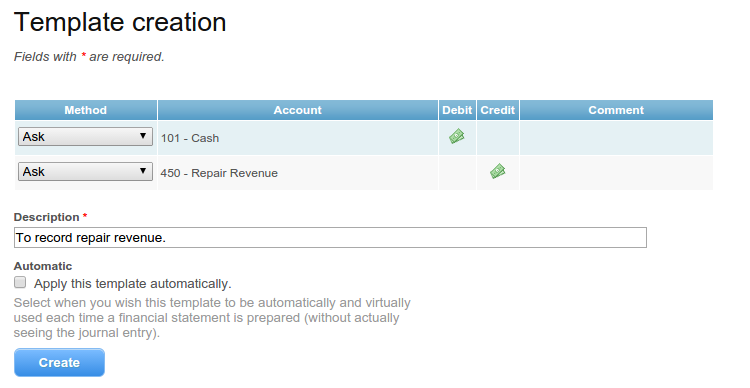 balance on match, if we want the amount to be computed so that the entry's debits and credits balance, but only if the resulting amount matches the ordinary outstanding balance for that account. For templates that are to be used manually, we'll probably want to use always ask or close. There is also an option to set if we want this template to be used automatically. We'll discuss that later. This saves us the need of selecting the accounts and remember where to put our numbers. Helpful, isn't it? The powerful thing comes when we check the "Apply this template automatically" box. Let's prepare two templates for the last entries of the month. This automatic entry will fail if we have a net loss for the month (we can choose balance anyway to avoid that this happens). We can set each template to be automatically applied or not, and we can delete it to make a new one, if we want. What are the benefits of these automatically-applied templates? If we don't have the last journal entries in our journal, the application knows how to compute all the needed data anyway. Let's check. 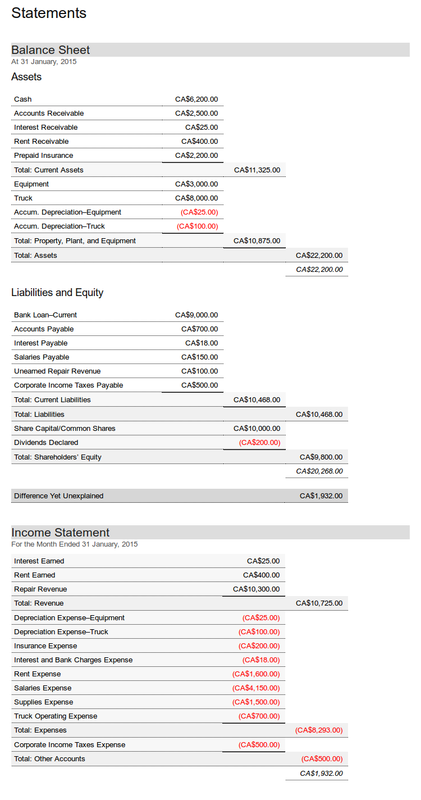 From our previous example, let's remove the last three entries (concerning income summary, retained earnings and dividends), and let's have a look at our Financial Statement. It will look exactly as the one that we prepared last time, with some magic going on behind the scenes.